Subaru are supporting a massive number of teams and events. So many that the whole list doesn’t even make it onto the screen grab of the Subaru Active website. 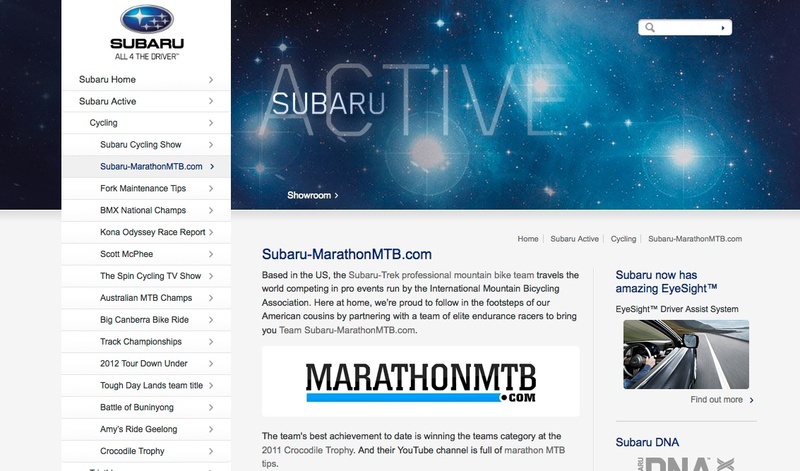 What did make it though is the beginning of the Subaru-MarathonMTB.com team page. Keep an eye on it to see how it develops over the next year of racing and riding. The support Subaru are providing to this team has enabled enough custom race kit to last everyone the full year, and additional financial support that make expensive races on the wish list an actual possibility. My Aussie teammates, Mike Blewitt and Naomi Hansen are currently dream-living over in South Africa as the countdown to the ABSA Cape Epic stage race pushes them toward the start line. I’m hoping to learn from the stage racing wisdom of these two when I join them in Alice Springs in May for the Ingkerreke Commercial MTB Enduro, a race I’ve followed in pictures for years. Meanwhile fellow teammates, Graeme Arnott and Tate Dogan are looking forward to the Wombat 100 down in Victoria. And that’s just half the races we’re doing this month. I’m not even sure which events Nick Both is racing – rumour has it he was going to put his calendar together once he finished assembling his bike. In any case, it’s fair to say that with the support of Subaru we’re certainly able to get around! “Thanks” as a word, doesn’t always convey the full gravity of appreciation for all the support that’s been offered to this team. But it doesn’t take much imagination to feel the big sense of excitement and appreciation that comes with the opportunity to ride in new places with so many new and shiny things. So thanks to everyone involved, we really appreciate your support. I hope the stories that get shared from these adventures encourage more people to discover fun places and enjoy the thrill of biking even more as well.